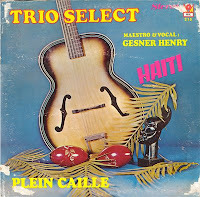 Legend has it that Jean Gesner Henry (1925-1998) went from a career in professional football (soccer) to one as a singer/guitarist. I wrote "legend has it", because it seems unlikely that there was a professional football league at the end of the 1940's or in the early 1950's in Haiti. Jean made a name for himself as a 'no-nonsense'defender, which earned him the nickname of Coupé Cloué ("cut and nail down"). Six years after his first musical steps he started Trio Crystal, which later evolved to Trio Select and, in the early 1970s, into L'Ensemble Select. He became quite popular too in West Africa, where he was sometimes compared to Franco. A comparison based on his sometimes rude (spoken) lyrics and on his typical guitar style. UPDATE (Dec. 29, 2009): The file has been uploaded to another server and should be available again. Thank you for sharing this. I can wholeheartedly point you towards a compilation I did of his later full-group sound, which is called "Maximum Compas", filled with maximum wonderfulness! music. Thanks so much, just love that easyness. And unfortunately the link is dead (the download site does not seem to exist anymore). @FroguetteMiNote: I have uploaded the file to another server.